We decided to start at Guffy Campground and go clockwise. 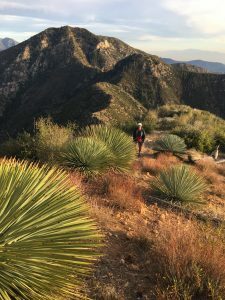 I wanted to make sure that we did the San Antonio ridge during the day and as much of Rattlesnake to South Hawkins in daylight as well. When we started the wind was howling and it was 28 degrees before windchill. We all packed pretty light, knowing that It would warm up soon. 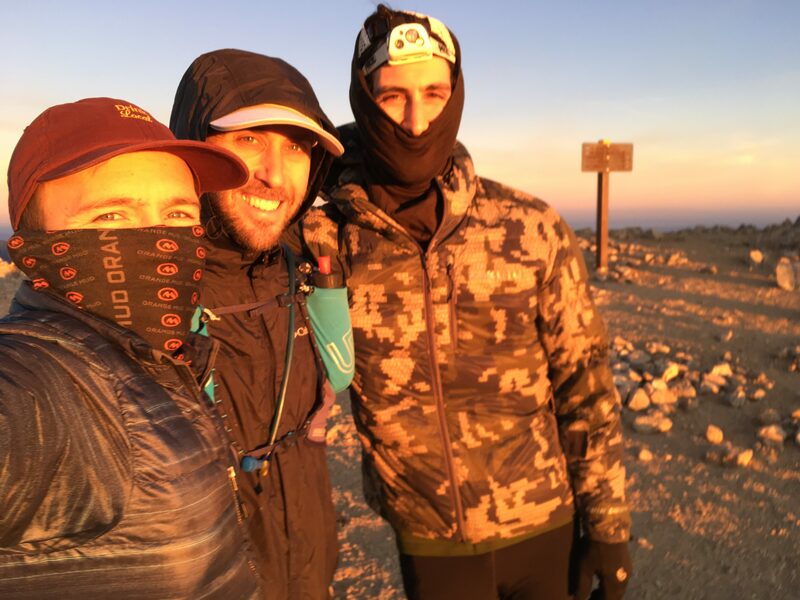 All 3 of us are ultra runners that have been getting into more difficult hiking the past few years. So we use small running packs, trail shoes, and try to keep it as light as possible while still being safe. Myself and Andreas use a Garmin in reach to message people our progress and in case we ever have to SOS. 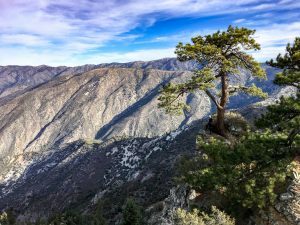 From Guffy, it’s only a couple miles until you go off the PCT and start venturing toward Baldy. 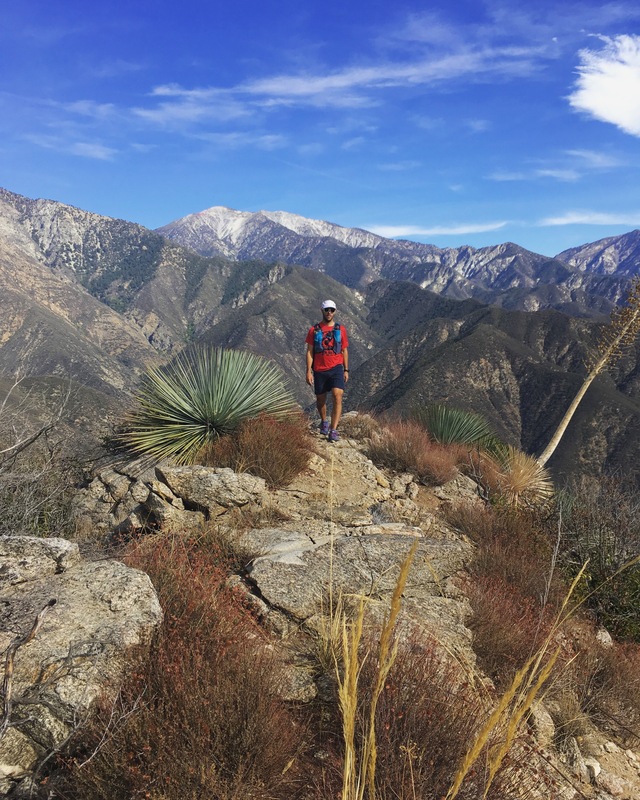 I’ve done this route once before when I thought it would be a good idea to start at the base of Baldy, run to Wrightwood for lunch then run back. You think “PCT is at 8300’ and Baldy is at 10,000’, how hard can that be?” But there are 2 summits in the middle, Pine at 9500’ then you dip to 9000’, Dawson at 9400’, then you dip to 8700’ before the climb to Baldy. Then the fun part starts. 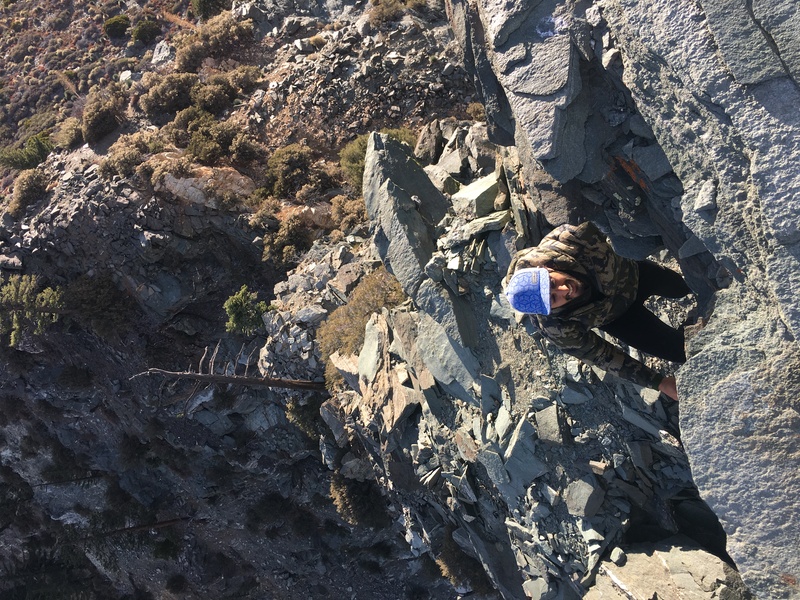 You jump off of West Baldy down a really steep section before landing on a knife ridge that you follow for 5 miles. The most well know section of this traverse is called Gun Sight Notch and involves some mild rock climbing which would be super easy in your favorite rock gym but terribly frightening when you are in the middle of no where and the “boulder” is just a pile of rocks. 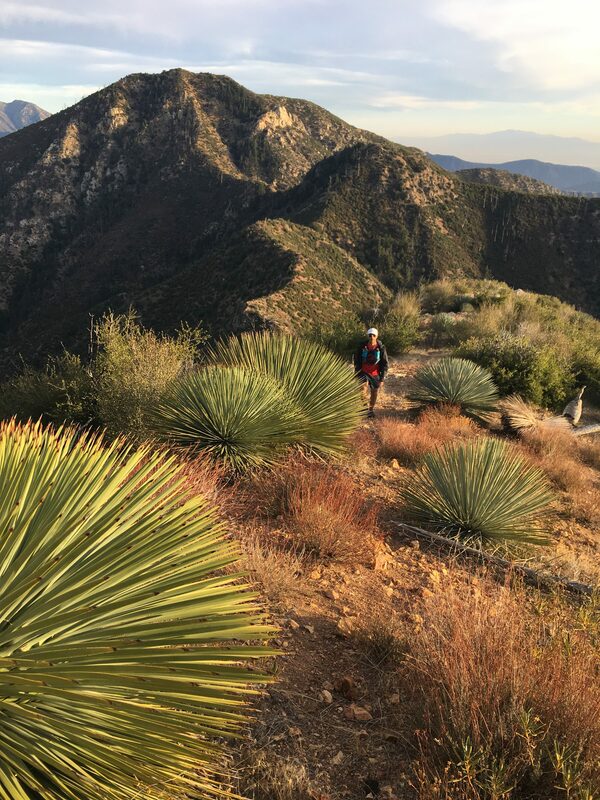 Then you climb up to Iron Mountain where you have a relentless 7 mile downhill where your toes are jammed against your toe box the whole time. I think each one of us fell 5 times coming down here. At the bottom is the East Fork river and the parking lot/party central, Heaton Flats. We parked my car here the day before and loaded it with water and food. So Aaron and I filled up then waited for Andreas to put on his lipstick for another 20 minutes. I don’t think this route is possible without a cache at Heaton, so I am glad we did that and also glad that my car didn’t get broken into. So far, I had done every section previously on training runs as an isolated section. But this next part was new to all of us and started with an awful scramble up to Shoemaker Road where there was a LOT of cursing. 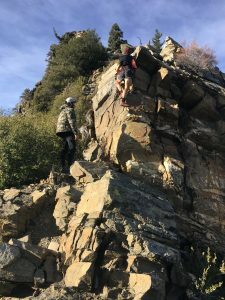 The trail to Rattlesnake is steep but easy to follow. Very similar to Iron Mountain climb. But then you need to make it up to South Hawkins. It starts with drop down from Rattlesnake onto the ridge that is not easy to follow and very technical. Once on the ridge, it’s really overgrown with very spikey plants and hard to follow. But Aaron took the lead finding a great route. In the middle of this climb the sun set but luckily, we were out of the thick of the bushes and just pushed forward up the ridge towards South Hawkins. 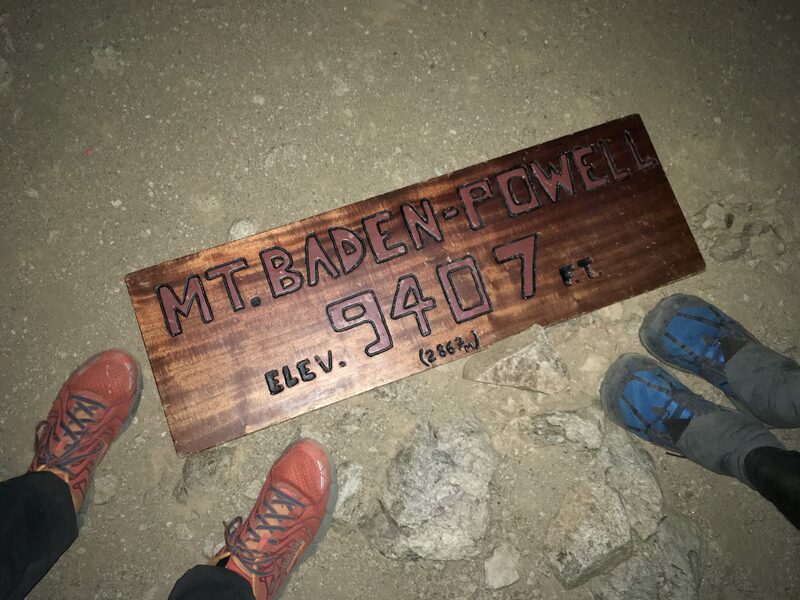 South Hawkins, after a couple miles meets the PCT which brings you to Baden Powell. Its a pretty steady grade on a well groomed PCT trail. It was really cold at this point and the wind was pretty crazy. I couldn’t muster the energy to take off my face cover to eat or drink anything, so I was going extremely slow. After an hour or me looking like I was going to fall over, Andreas made me eat caffeine and drink some of my water. Then he told me that he had an extra windbreaker in his pack the whole time, so I doubled up on windbreakers and felt like a new man. We reached the summit then ran the whole way down. I was amazed that we still had that energy to get down Baden Powell in just over an hour. We had cached water at Vincent Gap on our drive to Guffy in the morning. So we filled up and headed along the rolling PCT trail like a pack of sleep-deprived Zombies. I was friggin’ toast by this point. I was so cold and tired. Aaron led the head of the pack with Andreas behind him and I would be in the back trying to muster the energy to keep up. 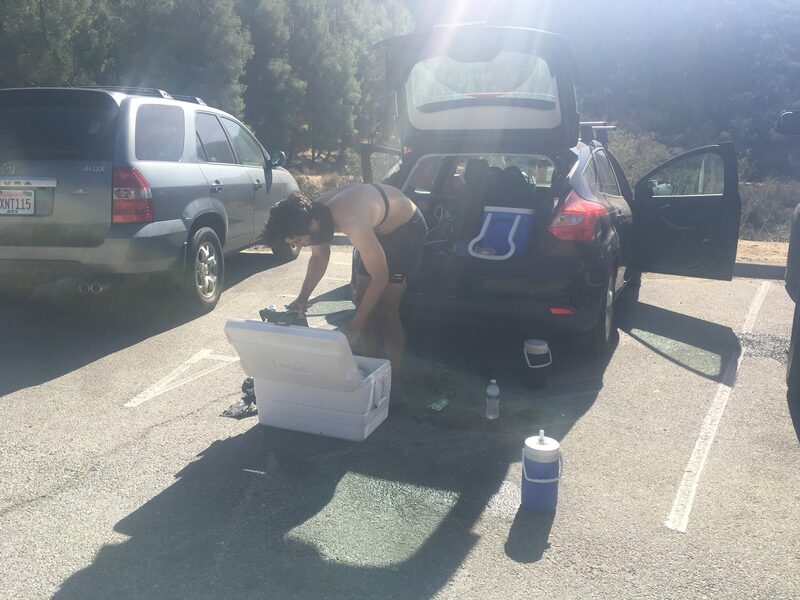 But after 9 miles of up/down and twisty turny on the PCT we made it back to our car and had finished! We quickly drove back to our AirBnB in Wrightwood. After all the summits, and 18,000 ft of climbing I was finally doing what I had dreamed of all day; laying down in a bed inside a room with a heater.